Ninth Ward is a great choice for classroom or homeschooling use. It will spur at least a quick study of the events surrounding the disaster that was Hurricane Katrina and the ensuing tragedies that affected thousands of people. Or it may inspire more in-depth research projects to prep for or react to a reading of the novel. I used the book in a class of 6th graders. My students found the reading level easy but the content much harder to mentally grasp–mostly because they didn’t have much prior knowledge of Katrina and the flooding of New Orleans before we discussed it in class. They loved the characters and the pacing of the book, and I loved that it was a historical MG novel set only ten years ago. 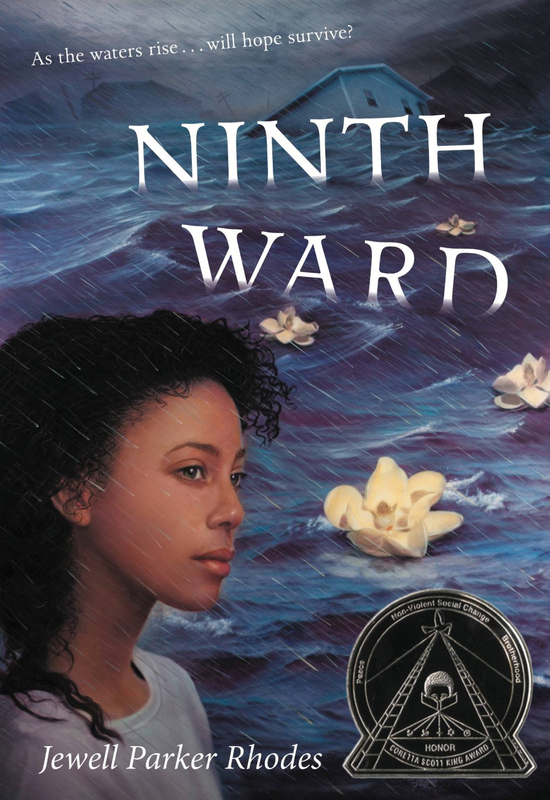 I think many kids, parents, and teachers tend to think of centuries-old eras, long-ago wars, and distant past events when we hear the label “historical novel.” Ninth Ward is recent history–history that has had a clear impact on the world in which they are living. Fast Summary: Lanesha is a 12-year-old girl living in the Ninth Ward neighborhood of New Orleans. She weathers the hurricane using strength, resolve, and quick-thinking skills…then she must survive the floodwaters, too. Note for teachers/homeschooling parents: Such a great and teachable book! Rich in plot and character details, great opportunities to discuss characters’ motivations and author’s purpose. Themes of hope, resilience, and gumption with plenty of evidence in Lanesha’s words and actions. Real world connections: Have students ask older folks (parents, teachers, friends, relatives) what news stories they recall from the days of constant media coverage surrounding the storm and its aftereffects. Any alarms/flashing lights? (Potentially controversial facets of the book) Well, the magical realism comes in the form of ghosts… Lanesha can see the bodies of dead people from a variety of eras, and she can communicate with some of them. One of the ghosts she can see is her mother, who died after giving birth to her. There is only the faintest tone of creepiness regarding this trait ; Lanesha treats it as something normal and natural. Mama Ya-Ya is the woman who cares for Lanesha, and though she keeps statues of Catholic saints handy, she also believes in “faiths born in Africa”… she believes in “many gods… (that) gods live in everything, in the whole wide world.” This is briefly mentioned and has little impact on the plot, though my students (in our small Catholic school) discussed how this trait contributed effectively to Mama Ya-Ya’s overall characterization. Posters from the 1960’s with the motto Make Love, Not War are given one mention to detail a setting. This has no other role in the book. There aren’t any instances of profane or questionable language in the book. Notes for writers and readers: This book is an excellent study in POV and voice–immediately the reader will connect with and know Lanesha, and know and understand her existence in the Ninth Ward. Great read! I look forward to teaching it again this coming school year.